A company called ‘Heart to Home’ recently contacted me asking if I would like to mention them here on Cakeyboi. They specialise in items for the kitchen and dining room, all designed in Britain. I took a look at their website and knew that you, dear Cakeyboi readers, would love to see their wares. ‘Heart to Home’ are based in Yorkshire and offer lots of great items such as aprons, crockery, tea cosies, tea towels, that sort of thing. They recently moved to new shop premises in Wetherby and have a website where you can browse all the goods on offer, and order them direct to your front door. They even offer free delivery on items over £10. I loved the fact their items are categorised by names such as Animal Magic, A Taste of Summer, Cosy Cushions – that sort of thing. Please pop over and take a look - you will be impressed. I particularly liked the Dachsund cooking apron and dog door stop ( I love dogs) and their owl tea cosy. I also loved the cup and saucer below called ‘Lay a Little Egg for Me’ by designer Sophie Allport, and the chicken napkins also designed by Sophie. These would be very useful with a freshly baked Cakeyboi treat and a fresh pot of hot tea. And Heart to Home have very kindly offered Cakeyboi readers a 10% discount on purchases made on the website. Simply enter the word CAKEYBOI where it says 'Apply Discount Code' at the checkout to receive it! I have been reliably informed that you can use this code as many times as you like. No snags other than a one-year expiry date. Not bad eh? And this is not all!! I am please to announce a giveaway from Heart to Home. 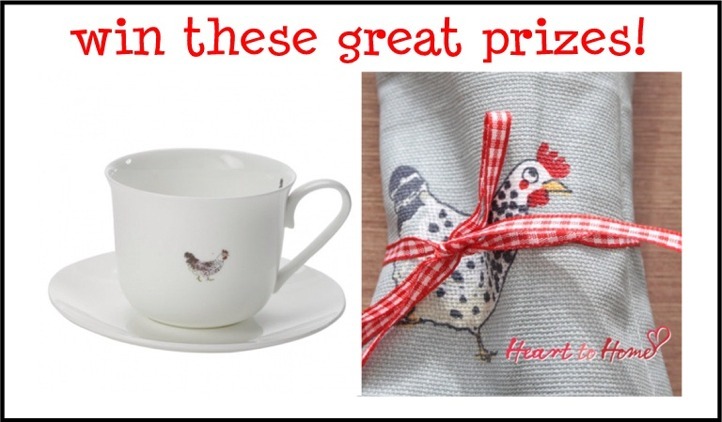 You can win 4 of those lovely chicken napkins (worth £11) and the ‘Lay a Little Egg for Me’ fine bone chine cup and saucer (worth £17) by entering via the Rafflecopter thingy below. This giveaway is open to all UK residents and runs from 11th July to 8th August giving you 4 weeks to enter. Good luck and thanks to ‘Heart to Home’! Disclosure Statement: I have not been paid for this post. Any views expressed are my own. i would love to, looks great! it would be cluckin' marvellous if I won! I'd love to win!!! I especially like the chicken print napkins! Gorgeous - definitely a talking point at the table! Love the owl tea cosy - so cute! i'd LOVE to win these so so so much!! I'd love to win these - they are gorgeous! Best of luck everybody and I hope you enjoy looking round our website! fingers crossed! i'd love to win - they're charming! So cute, they would look great in my kitchen! I'd love to win because I have fallen in love with the owl! So cute, very homely items! would love to win these as they would be great to use in photographs for my blog. I would love to win the cup, saucer and matching napkins because it would make a tea break something special. I'm on a diet :( and in dire need of a treat, with no calorific value. Very cute, I'd really love to win them. I would love to win these as have a friend they are perfect for! They would look so great in my kitchen. They would look great in my kitchen. I'd love to win as the prizes are so lovely! My daughter-in-law is chicken mad and I would love to win this for her - although I didn't know chickens needed napkins! Id love to win the Heart to home goodies they are so homely & lovely! 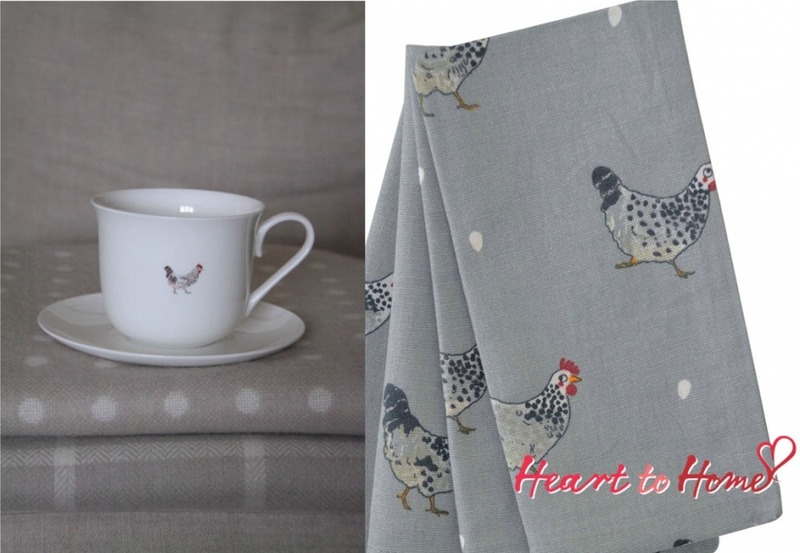 id Love to win these heart to home goodies they are truely homely & lovely! id be so happy if i won. i love chickens! I would love to win because I love the shabby chic style! Oh can't you see it's true. So I wrote this rhyme for you. I'd really love to win these for my home. Very cute. I have a traditional kitchen and these would look great. Great prize that I REALLY would like to win but it is in the lap of the gods. Gorgeous items, would love to win! So much, I'd kiss a chicken. I'd love to win this - even more so when I realised it was napkins with chickens printed on them, not napkins for chickens . . . I am obsessed with chickens! A little worryingly so... But this would fuel my addiction if I won! I would like to win this as these prizes are so adorable and would me a good talking point when i show people them as i'm sure they will ask where i got them from. I'd love to win these great prizes! Would love to win, they are beautiful! I would very much like to win, I already have cats on plates, bunnies on a mug and moo cows on a cup. So I really could do with chicken themed crockery as well. Would really love to win this prize.They are so cute. I have just decorated my kitchen so these would look gorgeous in there and fit in perfectly! I would love these as my kitchen has a 'chicken' theme! It would be grand to win this prize. I'd really love to - particularly the doggie! It would make my day if i won! Both the cup and napkins look lovely, so of course I'd love to win them. Lovely prizes, would love to win these! so cute! Would love this! Gorgeous prize, I love chickens. We love chickens and these designs are brilliant! I would love to win this to show to all my friends and family! I would love to win this so bad...awesome giveaway! Great to get some new bits as i hate parting with money. I'd love to win - it'd be something special for me - as opposed to anything featuring Disney / Hello Kitty etc that the kids have! I would love to win so much! I collect cups and saucers and this one has a chicken on aswell,what a bonus! I would love to win this as my kitchen after renting for 6 years needs a serious update!! I can't buy anything new as saving for a house deposit so this would be a lovely treat! The prize is in my sight! Would love to win, as I know someone I'd like to gift them to. She keeps chickens, and would just love the chicken bone china cup and saucer. With the tea towels too, I'm sure she would be just delighted. I would love to win, as I know jut who I would like to gift them too. She keeps chickens, so would just love the chicken bone china cup and saucer. With the tea towels too, I'm sure she would be just delighted. My cat said she's very interested in pictures of chickens and has begged me to enter this competition. 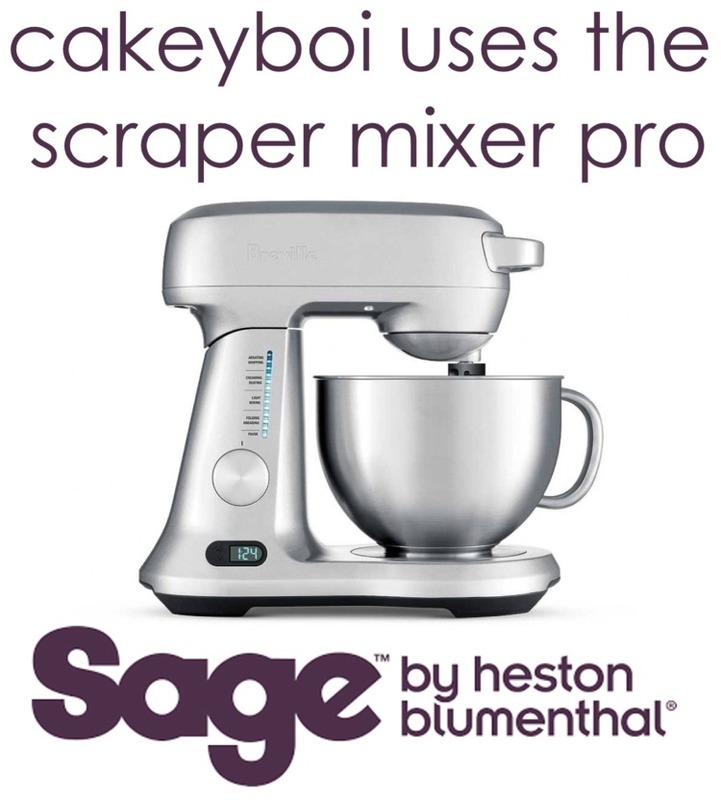 Would love to win these and enjoy a lovely cuppa in a beautiful cup with matching napkins to catch the cake crumbs!! amazingly gorgeous set of crockery! I would absolutely love to win it because it would really brighten up my home and make it 1000 times better! Also, it would be cluckin' marvellous! My chickens would appreciate that they are famous & we'd love to win. These are gorgeous. Would make a great pressie for my beautiful niece, Leila. Would be great to win to help make my flat look much better! its a fantastic prize! im currently trying to get my self a lovely little tea set (mostly from car boots lol) this would be so wonderful i couldn't even begin to describe it! thank you very much for the opportunity and my fingers are crossed! I'd love to win - I have a slight obsession with farm animal related things! Great prizes, I would love to win them. my mum's just having her kitchen dragged into this century and she'd love these in her new kitchen - thanks! I would love to win - they're so cute! Wow! They do have some lovely stuff don't they?! I love Sophie Allport designs so this giveaway would be right up my street! love it! I love the owl tea cosy so much I'd go out and buy a teapot! love to win it as getting a new kitchen soon! love to win it, getting a new kitchen soon! Having bought from them I can tell you the quality is excellent . Personal preference the dog motifs. Such cute items. I'd give them a good home! I would love to win these they look amazing! Most of my houseware is old and tired like me. These look beautiful and will make such a difference to me. All my houseware is old and tired like me. These would make such a difference.